This week our almost two-year old had a 103 degree fever and I was feeling the fung lurking a little too close for comfort. So what was a pioneer gal to do? Make Chicken Soup, of course! This recipe is our very own Slovak version of Jewish Penicillin. God’s chosen knew what they were doing when they crafted their brew and so do we. So give me an Oy! Give me a Vay! We’re just meshugga about it. 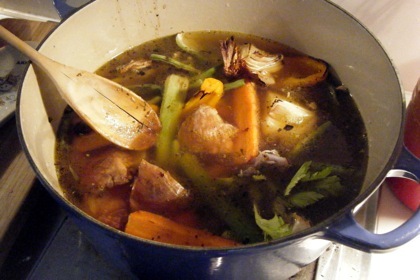 Throw everything, except for the last three ingredients, into a large stock pot. Bring to a boil. Turn down heat and simmer for at least 4 hours, preferable 8. Pick out the bird and set it aside. strain the rest of the broth to get out everything remaining. Pick out the good bits of meat and throw back into the broth. Cool. Refrigerate until all the fat is congealed on the top. Skim fat off. Heat and add the cooked carrots and potatoes. Dish the noodle up separately and top with the soup. Several bowls later and all the questionable nonsense will leave your body without any trouble. And I don’t mean maybe.